Small in size but big on style and performance, this compact colour A4 MFP—with a footprint of just 429 × 509 mm—can bring convenient three-in-one functionality to any workplace. Ideal for streamlining the business operations of small workgroups in large offices or as the solo document performer in SOHO, small shops, and more, the MX-C250 copies, prints, and scans with ease. As document demands increasingly move from out behind the desk to wherever business takes you, Sharpdesk Mobile—an easy-access mobile print/scan application that connects Sharp MFPs to popular mobile devices via a wireless LAN connection—can help you keep pace. 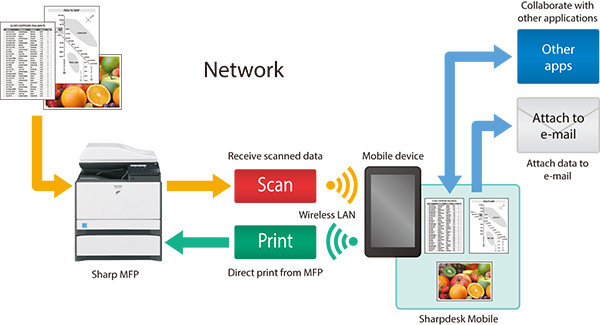 Documents scanned on a Sharp MFP can be sent to a mobile device to preview and save. And documents saved on a mobile device can be printed out on the MFP, sent as e-mail attachments, or used in other applications. By combining the efficiency of Sharp MFPs and the convenience of mobile devices, Sharpdesk Mobile is adapting document usage to today’s changing work styles. Note: Availability varies by country/region. For details, see the Sharpdesk Mobile support Web site. This function enables commercially available business card scan software to create business card databases.